What does it mean to be a Certified Zentangle Teacher? First of all, there is only a hand full of CZTs in the country - around 150. Those individuals have completed the workshop held by Maria Thomas and Rick Roberts, founders of Zentangle. They have studied the patterns and practices of Zentangle and understand the philosophy behind the art form. There is a big difference between Zentangles and doodles. If you are interested in learning about Zentangles, I highly suggest you take a class from a CZT. 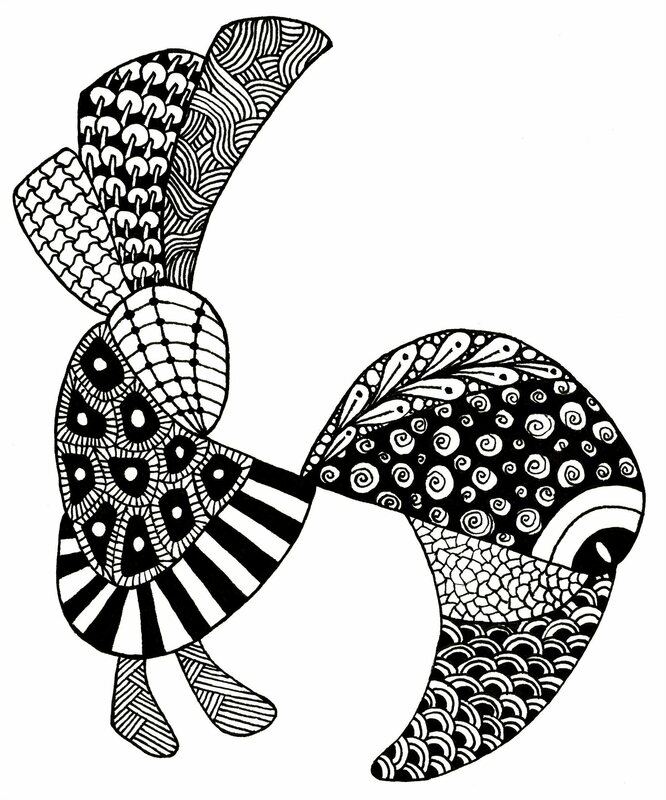 Click here for a list of Certified Zentangle Teachers. Maria Thomas and Rick Roberts created Zentangle several years ago after Rick noticed how calm, relaxed and focused Maria was while working on a lettering art piece. It is best to hear them tell their own story and read about them on their web site at www.zentangle.com. Here though, I would like to tell you my own personal impression when meeting the couple at the 2nd CZT workshop held in October 2009 at a wonderful mansion retreat in Whitinsville, Maryland (outside of Boston). The setting was rustic and beautiful - a perfect location to take in the world of Zentangles. The couple had put together a great workshop. Just meeting them and spending time listening to their take on life was wonderful. They are very down to earth, very generous and very talented! Additionally, they opened up their home where we were all able to admire all the beautiful art work Maria has done. If you ever have a chance to meet them and/or take one of their workshops, you will not be disappointed. Here is another "classic" Zentangle. I love drawing these on the airplane or while waiting at the doctor's office. The meditative aspect of Zentangles has helped reduce my fear of flying and stops me from yelling at my doctor for keeping me waiting for hours. Seriously, knowing that I always have a pen and paper in my purse, helps reduce my anxiety level. A "classic" Zentangle is drawn on a 3 1/2 x 3 1/2 paper tile. Using a pencil, draw a dot in each corner of the tile about 1/4" from the edge. Connect the dots to create a border. Then draw a "string" inside the borders creating four or five random sections. In each section, draw a pattern of your choice. This is where the fun begins. There are so many patterns and variations on patterns. The official Zentangle web site demonstrates many of the beautiful patterns Maria and Rick have cleverly named. If you where comparing this particular tile of mine with other artists, that I have drawn this with a no particular flare and also with a somewhat bold stroke. This is a good way to start. The more you tangle, the more your style will develop. Many years ago, I stumbled across the word Zentangle in a blog. Whatever I read and whatever I saw, took me immediately to the the official Zentangle web site. Not being one to stop and read instructions, I jumped in immediately with pen and paper. Those first few Zentangles were pretty pathetic. So I went back and studied the web site and then search for anything else I could find on the internet about this interesting art form. I was hooked. I was filling up all those pretty sketchbooks I bought over the years and never did anything with. I had page after page of "pretty doodles." Oops, that is a bad word - doodle. Zentangle is not doodling! More on that important subject in later posts. I do hope you join me as I share "tangle, tangle, tangle."